Week 12: Experts in authoritarianism advise to keep a list of things subtly changing around you, so you’ll remember. 1. Protests over Trump’s Muslim ban took place all over the country and around the world. Thousands protested in major airports and cities, including many red states. 2. Trump’s executive order was criticized by many, and supported by few. Christian leaders spoke out voraciously against prioritizing Christian refugees. 3. Innumerable horrid stories about the impact of the Muslim ban surfaced during the week. Spicer minimized its impact. Presidents of 598 colleges and universities wrote a letter of concern about the ban. 4. Trump promoted Bannon, under a reorganization of the National Security Council, to a regular seat on the principals committee. Criticism and outrage of this move was widespread. Democrats proposed a bill to remove Bannon from the NSC. 5. A federal judge in NY issued a temporary order, blocking Trump’s executive order from deportation of arrivals. Next morning, the Department of Homeland Security issued a statement that they would not abide by the court order, and would continue to enforce Trump’s executive order. Four other federal judges issued similar temporary orders. 6. The Judicial Branch was removed from the WH website. It was later restored. 7. An op-ed “Trial Balloon for a Coup?,” which included a diagram showing an almost completely gutted State Department, trended for an entire day. 8. In just 12 hours, more than 875k people in the UK signed a petition, demanding Trump’s state visit to Britain be canceled. 9. Germany’s Merkel, per her spokesperson, had to explain the Geneva Convention, and the requirement for the international community to take in war refugees on humanitarian grounds, to Trump. 10. Books topping the Amazon list included 1984, It Can’t Happen Here, and Brave New World. 11. Trump continued to say his executive order should not be termed a “Muslim Ban.” Trump insider Rudy Giuliani told Fox News that Trump had called him seeking advice for a “Muslim Ban” and how to do it legally. 12. According Sen. Mark Rubio, the State Department was instructed not to speak to Congress about Trump’s Muslim Ban. 13. On a day when the NYT described Bannon’s elevation and Michael Flynn stumbling, Flynn’s Twitter account was taken down. 14. AP reported the voter fraud expert chosen by Trump to conduct his voter fraud investigation, is registered to vote in three states. 15. Politico reported that several House Judiciary Committee aides secretly worked on Trump’s Muslim ban. Their bosses were not aware of the EO or their staffs’ involvement. 16. Acting Attorney General Sally Yates directed the Justice Department not to defend Trump’s Muslim Ban, citing the ban not being legal. 18. WSJ reported that Trump’s tax plan, counter to changes proposed by Congressional Republicans, would preserve millions in tax benefits for Trump companies. 19. Days after Trump’s phone conversation with Putin, Russia escalated hostilities in the Ukraine. Among the chaos of the Muslim ban, etc., few in the US noticed. 20. Six were killed in a mosque shooting in Quebec. The perpetrator was a white man, who “liked” Trump’s Facebook page. The next day, the Eiffel Tower went dark overnight in support. Trump, however, said nothing publicly about the attack. 21. The WH publicly stated that any State Department employees who disagree with Trump’s Muslim ban should resign. 22. As Trump prepares to name his Supreme Court pick, for the first time in decades, no one is bothering to advocate for diversity anymore. 24. Trump announced his Supreme Court nominee in reality-tv show type format, claiming he had invited both finalists to the prime-time announcement. 25. Trump’s sons, who are running his business supposedly walled-off, sat in the front row for the Supreme Court announcement, and mingled with politicians, including the Chair of the Senate Finance Committee. 26. WAPO reported that Eric Trump’s business trip to Uruguay in January for the Trump Organization cost tax-payers nearly $100,000 in hotel rooms for Secret Service and embassy staff. 28. Trump canceled a trip to Milwaukee, where he was scheduled to deliver an economic address, due to the threat of protests. 29. The House Oversight Committee stopped accepting calls relating to investigating Trump. 30. As part of Black History Month, Trump cited Frederick Douglass, whom he described as still alive, and Pence tweeted about a white man. 31. Trump’s first overseas raid ended in failure. Among the dead were a Navy SEAL and 15 women and children, including an 8 year-old American. Trump has relaxed Obama’s stance on protecting civilians. 33. Spicer admitted that Trump was not in the Situation Room during the Yemen raid. He issued the green light while at dinner, and during the raid itself, Trump was busy sending unrelated, incendiary tweets. 34. In the third wave of mass disruption in January, 17 Jewish Community Centers (JCCs) received bomb threats. 35. FLOTUS Melania Trump said she and Barron may never move to the WH. 36. Reuters’ Editor-in-Chief announced that their reporters would cover the Trump administration as an authoritarian regime. 37. On the day Tillerson was confirmed, the House killed a transparency rules which required oil companies to report payments to foreign governments. As Exxon CEO, Tillerson had lobbied against this provision. 38. The House’s move on transparency also impacts the ability to trace the owner of a 19% stake of Roseneft, mentioned in Week 11’s list. 40. Trump’s first call with Australia, one of our closest allies, went terribly, and ended prematurely after, according to Australian media, Trump berated PM Turnbull. 41. Later that night at 10:55 pm, Trump tweeted Obama had agreed “to take thousands of illegal immigrants from Australia.” This is a lie: Obama accepted 1,250 refugees. Next day, McCain called Turnbull to express US support. Rep. Steny Hoyer also issued a statement of support. 42. Trump opened his remarks at the National Prayer Service by attacking Arnold Schwarzenegger for The Apprentice getting low ratings. Trump continues to hold the role of Executive Producer of the show. 43. Later at the National Prayer Service, Trump promised to “totally destroy” the Johnson Amendment, which forbids churches from political activity in order to maintain their tax-exempt status. 44. Trump lifted sanctions, introduced by Obama in December, on Russia’s Financial Security Service (FSB). A former head of Russia’s FSB claimed this to be the start of a formal “anti-terror alliance” in the DUMA. 45. Virginia filed a contempt motion against Trump over his Muslim ban, asking the US District Court to make sure that the federal government complied with the temporary restraining order. 46. At the hearing, the Justice Department said over 100,000 visas have been revoked as part of Trump’s Muslim Ban. The State Department later said the number was closer to 60,000. 47. NBC reported, via a FOIA request, that emails reveal Ethics officials warned Trump against an ‘unprecedented’ efforts to staff his cabinet without ethics vetting. Trump aides rebuffed OCE efforts. 48. As per the Week 11 List, Trump issued a Holocaust statement without mentioning Jews. This week, Politico reported the State Department’s draft statement did reference Jewish victims, but Trump team took it out. 49. Due to lower sales caused by boycotts, both Nordstrom and Neiman Marcus announced, they will no longer carry Ivanka Trump’s brand. 50. A poll by Public Policy Polling (PPP) revealed that 40% of registered voters support impeaching Trump. Polls asking during Nixon years, didn’t reach this level until 16 weeks into the Watergate scandal. 51. A former PM of Norway was detained for hours at Dulles Airport because his passport showed a visit to Iran in 2014. 52. Trump ordered female staffers to “dress like women.” Twitter mocked his words, with a campaign using the hashtag #DressLikeAWoman. 53. Conway continued telling outright lies, citing a fabricated Bowling Green Massacre as a rationale for Trump’s Muslim ban. 54. Trump said he would be “cutting a lot out of Dodd Frank” since his friends with “nice businesses” are having a hard time borrowing money, because of rules and regulations. 55. NPR reported that Trump faces 55 lawsuits in his first two weeks — as compared to 5 for Obama, 4 for W. Bush and 5 for Clinton. 56. The New Yorker and Vanity Fair canceled their involvement with White House Correspondents’ Dinner parties. 57. As the week came to a close, a federal judge appointed by President Bush ruled that Trump’s Muslim ban executive order be halted, nationwide, immediately. 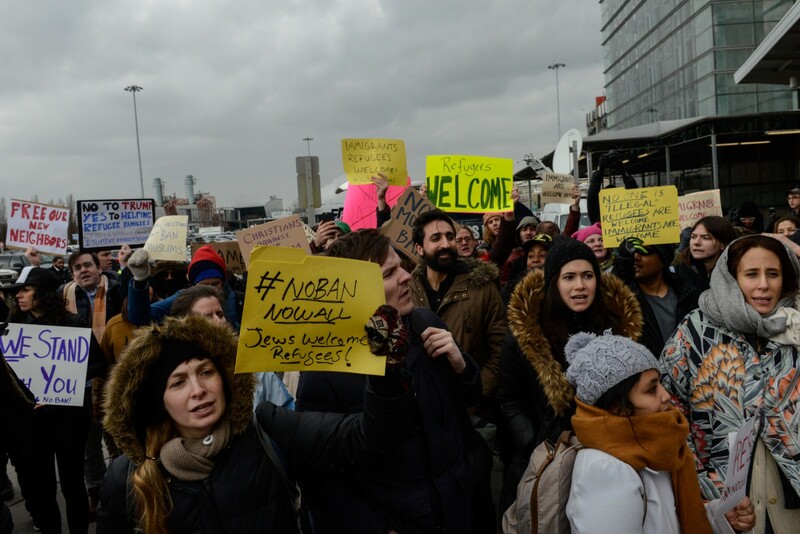 Protesters rally during a protest against Trump’s Muslim ban at John F. Kennedy International Airport in New York City.